• Why some people make communication look so easy? • Why we decide we’re going to listen to some speakers before they even open their mouths? • Why we listen, captivated, as they talk? • And can we learn from what they do? 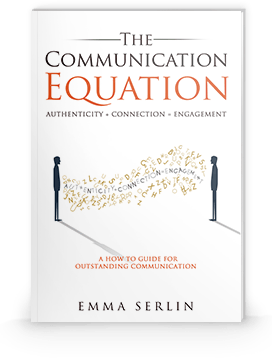 The Communication Equation is the result of 3 years of work and we are delighted to have the finished edition for sale on this website. If you want to get a flavour of the book you can simply download the first three chapters here. We hope you enjoy the read and would love to hear any comments you have. In this inspiring and practical book, Emma Serlin shares the lessons she’s learned as an award-winning theatre director, coach and advisor to some of the world’s leading business people. Whether it’s increasing your confidence when you speak, knowing how to handle difficult conversations, or inspiring those around you, Serlin shares techniques that are rooted in the fundamental principles of psychology and coaching. Using these principles, the book gives you an indispensable toolbox of tips and techniques designed with the real world in mind. It will help you thrive at work, at home and in your personal relationships. 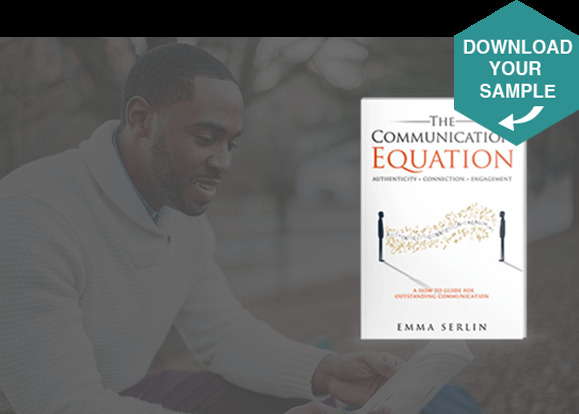 The Communication Equation will change the way you get your message across, giving you the keys to communicate with an easy sense of confidence.